I’m closing out my first week in Sitka, and what strikes me most is that this place still feels as unrooted as it did for me the night I arrived. I recall from Forrest Gander’s Core Samples from the World: “…Every place is equally exotic and numbingly familiar.” Granted, there’s something to that, but my past experience with new places has been that I’ll eventually settle into a kind of rhythm regarding their particular ‘exoticness’ and slowly improve at navigating it. Sometimes that slides into full habituation if I live there long enough. Other times, this limbo of ‘familiar unfamiliarity’ is what I continue to float through during extended travel. I first noticed this about the town when I was taking a walk the next day with Lila, who’s also visiting. She half-jokingly pointed out the mountains that surround us (mountains that seem to hover above this place as constantly and distantly as the clouds themselves), and how she used to think they were following her because they’d be everywhere she looked. We’re both foreign enough to this place so that its central landscapes continue to jump out and startle us. There’s a fascinating dynamic between the hazy, comfortable small-town life in the heart of the neighborhood; and the small shocks we receive as soon as we venture near its edges and are met with the harbors, mountains, and small islands that bob just beyond its shores—a reminder you’re on the rim of the world. And so, I realized Sitkans do nurse their capacity for awe—it’s simply kept tucked away during the day so they can give enough attention to the tasks that keep their work and lives well-oiled and turning. Alternations of depth and gazing—rarely have I encountered them as closely as I have during my short time here. “…One step forward and we are with them. One step back, another realm absorbs us” (Forrest Gander, “A Clearing”). Serin Lee is a summer intern with Artchange Inc. and a rising Sophomore at the University of Chicago planning to major in English Language & Literature, and potentially Anthropology. She is interested in stories and culture, and their convergence in film as a means of navigating elements of home and place. Uprivers is the story of two women fighting for what they love: their homeland and way of life. The stories of two indigenous women on either side of the Alaska / British Columbia border make a compelling argument for why our two nations should work together to protect our shared rivers. If you’ve been concerned about Canadian mining in the headwaters of the Unuk or other transboundary rivers, this film will inspire and inform you. Hosted by the film's director, Jackson Matthews, and protagonists, Carrie James and Jacinda Mack. There will be opportunities for discussion and to take action after the screenings. Contact upriversfilm@gmail.com for more information or to set up a screening. We want to encourage you to check out 14 Miles: Dispatches from an Island in Alaska. 14 Miles is an experiment asking universal questions about democracy, geography, community, and change through local stories. Please share them with your networks! Want to see episodes as we release them? Follow us on Facebook, subscribe on YouTube, or visit us at 14Miles.org. Want to help support the project? Find out more. Become a subscriber at any level! • If you've seen this heartfelt documentary, made with Haida Weaver and elder, Delores Churchill, you know we set out on a journey into origins of a spruce root hat found with Kwäday Dän Ts’ìnchi, also known as the Long Ago Person Found, in a retreating glacier in Northern Canada. Delores decided to replicate the hat, but by the time we finished the film and set off to share it, it wasn't finished. Now it is! Listen to this story and interview with Delores on KRBD, Ketchikan Public Radio. • Also. we will be showing Tracing Roots: a Weaver's Journey on March 28th, in San Francisco at a gathering of The American Society on Aging. The film has many themes, but the one we are looking forward to emphasizing at this screening is how Delores Churchill exemplifies the connection of community, culture and creativity to healthy aging. Performers are getting ready, VIP Tickets are sold out, as are almost half of the general admission tickets for the Ramshackle Cabaret, on February 16th and 17th in Sitka! The Ramshackle Cabaret was founded with a rebellious spirit with the goal to provide the community with provocative entertainment. It is a platform for local volunteers to showcase their untapped, and often unconventional, talents. The Cabaret exists to support reproductive and sexual health and all proceeds will go to support this cause. Each year's production brings local talent to the stage creating an adult variety show featuring comedy, dance, burlesque and more, with proceeds going to organizations in Alaska that support reproductive and sexual health. Artchange, inc. partners with this group to provide organizational support! We'll be catching up soon and posting stories from these events soon! Listen to some of our past stories. Thanks to our wonderful and supportive local audience and tellers too! The journey continues! We're excited to collaborate, create and share episodes with themes that resonate locally and we hope far beyond. We just posted Episode 9. “A Family that Ninja’s Together….” One of the fun parts of this project is spending time in new places within our small community. We’ve also have been thinking about the challenges and possibilities of operating a small businesses on this island. What corners or parts of your community have you never explored? What does it take to run a family business? We hope this will be a template for people to celebrate the places they live, be it an urban neighborhood or an island community in Alaska. We will be packaging films to air on Alaska Public Media, making DVDs and more. Please share them with your networks! New episodes will be released twice a month. 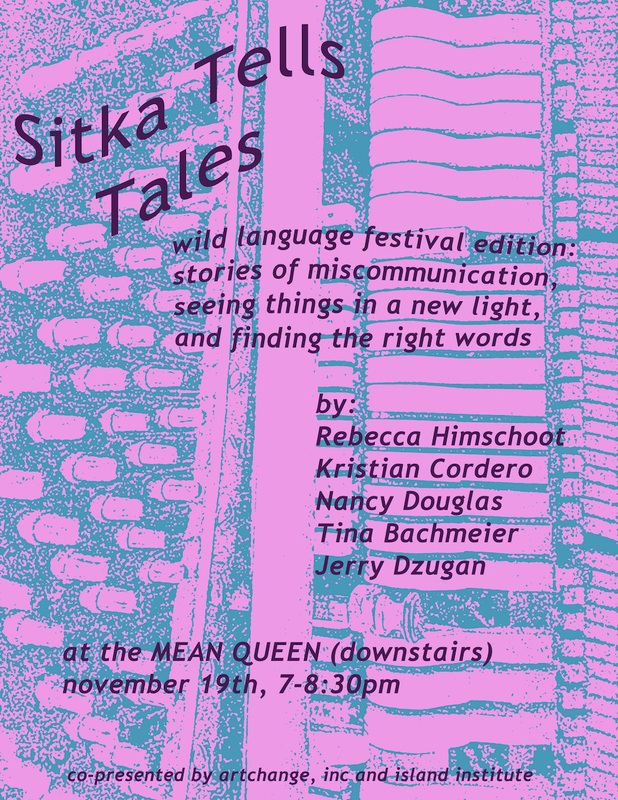 Sunday, November 19th 7-8:30 PM at the Mean Queen. Stories of miscommunication, seeing things in a new light, and finding the right words.Want to tell a tale at a future event? Let us know! Listen to past episodes here. Thanks to all who attended our Health Care Town Hall this past July. Access to affordable health care is still under debate. We will continue to encourage dialogue and action around this, and encourage people to sign up for an insurance plan during the open enrollment period, which runs through December 15, 2017.